City Art is an exciting exhibit of outdoor sculptures displayed year-round in the City Centers of Mankato and North Mankato. Artists place their sculptures in the program for one year. The sculptures are promoted to the public for sale or lease. Artists are eligible to win cash awards. The sculpture voted People’s Choice is purchased by the City Center Partnership for permanent installation in the City Center. CityArt On the Go is a public art exhibit on traffic signal box where pedestrians and drivers in the City Center enjoy various colorful murals, turning infrastructure into art. 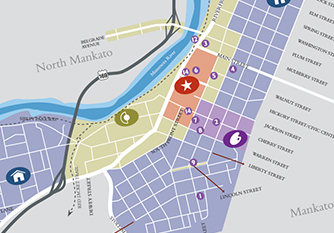 Each year, the City Center Partnership produces the City Center Guide, which informs residents and visitors of opportunities to enjoy the City Center’s assets. Alive After 5 is a late summer family-friendly free concert series in the Civic Center Plaza. Bring your lawn chair or blanket and enjoy food, drinks and great live music. High-caliber music acts give a great show, with different musical genres represented throughout the series. This annual kickoff to the Minnesota State, Mankato Hockey Season with live music, food and drinks and is a collaborative effort between MSU Athletics and the City Center Partnership. The City Center Partnership works to support Shop Small Saturday programs in the City Center. Efforts include coordinating with businesses and assisting with joint marketing materials. The Open Space & Tactical Urbanism Plan is an initiative of the City Center Partnership and seeks to assess the attributes of your City Center public spaces and seek appropriate programing for those spaces. The goal is to activate the public realm and enhance the vibrancy of our City Center. The development of this plan is currently in progress. The Arts & Historic District Dialogue is a community initiative coordinated by the City Center Partnership to assess how we might proactively cultivate our Arts & Historic District into an authentic and sustainable top five arts and cultural district in the Upper Midwest. The Minnesota Valley Line is a proposed 84 mile long standard (79 mph) passenger rail line between the Twin Cities and Mankato with the preferred route including a “Y” shaped route connecting both Minneapolis and St Paul. Part of a larger corridor between Minneapolis/St Paul, Mankato, Worthington and Sioux City, IA; the Minneapolis/St Paul to Mankato section is one of only five Phase I passenger rail lines in the state. This line will accommodate four train sets per day and is the most cost effective route to build out of the five routes.